Culloden essentially marked the end of the Jacobite rebellion of 1745 and as such it is marked as one of the most well known moments in Jacobite and Scottish history. But, there were quite a few other rebellions that took place before the ’45 and this year marks the 300th anniversary of one of these – the 1715 Rebellion. The 1715 uprising is widely considered to be the Jacobite Uprising that should have worked. It had a large amount of support, across both Scotland and England, but it failed largely due to poor management and organisation. In 1714 Queen Anne died and the throne passed to George I and the Hanoverian line. George I thought the Tory government were pro-Jacobite and thus replaced them with a Whig government. There was widespread unrest about the new king and riots ensued in favour of the Jacobites across England. In March of 1715 King James VIII & III petitioned the Pope for money and military aid for a Jacobite uprising to capatilise on this tension. The plan was for two Jacobite uprisings to happen in England. First a diversionary smaller uprising in the north. Once the British army had rushed north to deal with this uprising, the main uprising in the south west of England would start. However, matters soon got complicated. In August the Earl of Mar returned to his estate in Scotland having failed to convince King George that he was not a Jacobite sympathizer. Here he held a council of war with leading Jacobites apparently unaware of James’ plans. On 6th September Mar and other local Jacobites raised the standard at Braemar and caught everyone by surprise. The timing of Mars’ independent rising could be fatal to King James’ plans. It could pull large parts of the British army North before the planned diversionary rising. Mars’ Jacobites took Inverness, attempted to take Edinburgh and then headed south and met up with English Jacobites in Northern England. All this action lead to leading Jacobites in south west England being arrested by the Government which effectively stopped the plans for a main rising in the south. In November 1715 the Jacobite actions came to their climax. From 10th-12th November remaining Jacobites in the Highlands took part in the Siege of Inverness which occurred when Government forces tried to take back the town. In the process of this Government man Arthur Rose, son of Kilravock was killed and Kilravock seeked revenge. With threats to burn Inverness to the ground the Jacobites met to discuss surrender. The Jacobites wanted to march south and join Mar but this was not allowed and eventually they agreed to hand over their weapons and return home and hand Inverness back to the Government. Meanwhile from 12-14th November the Battle of Preston occurred with the English Jacobite rising trapped in Preston and eventually forced to surrender to the Government. Finally on 13th November the Battle of Sheriffmuir occurred, this was the main battle of 1715. The Government were seriously outnumbered by Mars’ Jacobites but Mar refused to press home the advantage and risk his entire army so allowed the Government to withdraw after a day of fighting. There was no conclusive victor but the battle caused demoralisation amongst the Jacobites who should have won based on numbers. After this nothing major happened only a few minor skirmishes. In an attempt to maintain the rising King James VIII & III arrived in Scotland in December but by this time the Jacobite army was suffering heavily from desertions and he left in February 1716 as the rising had essentially fizzled out. Overall Government losses for the 1715 Uprising are estimated around 1,000 men whilst Jacobites lost roughly 250 men. If the men had been more coordinated in their attacks and had formed a united front rather than seperate groups who knows what the outcome may have been? This September we will be marking the 300th anniversary of the rising with a special 1715 exhibition . So far plans are going well and we have letters from the Highland Archive Centre to showcase and hopefully a renactment of the raising of the standard at Braemar. Hope you enjoyed the post. As always like, share, comment, blog and follow us to your hearts content. Anyone for Sheep’s Head Soup? Just when we thought we couldn’t get anything more gruesome for you to make than haggis we found a recipe for the classic ‘Sheeps Head Soop’. To be fair we didn’t think it sounded too bad until the end where one side of the head was to be served in the middle of the soup. We didn’t fancy staring down and seeing half a head looking back at us! Luckily puddings have proved to be much nicer including this recipe for Plum Cakes. Take a pnd of flower well dryed, 1 pnd of butter & a pnd of currants well washed & pickd, 3 qrt of a pound of white sugar well sifted, six yolks and 2 white well beaten. Beat the butter with a little orange flower water with yr hand till it cream, then put in yr corrants & a whole nutmeg. Then beat it again. Then mix the flower & sugar & put it in by handfulls, till all be in. Keep itt beating an hour after and when the oven is hot, butter yr pans. Yr oven must be as hot as for cheesecakes. This one sounded much nicer especially the addition of nutmeg and is definitely one we would be tempted to try. One final recipe to share with you this week, though this one is slightly different. Instead of something to eat we found a recipe for some lip balm! Take a pint & half of claret, a qr of a pd of currants, 1 pd of butter without salt, 4 or 5 ounces of Virgins Wax & 2 ounces of ye root Alkanet, otherwise call’d Alcony. This last with ye wine & currants must be boyl’d a pritty while. Afterwards, ye butter & wax being put in, must be boyl’d a little, then strain all into a bason. If, when cold, you find it too soft, add more wax. If too hard, add more butter. When it tis cold, ye top must be taken of & melted by it self & strain’d into little cups for use. If you have a mind to sweeten it, strain it with orange flower water or what else you think fit. We looked into it and Alkanet, or Alcony, is a herb which can be cultivated for its dye. The rind of the root can be used to produce a deep red colour, perfect for the lips. Hopefully you’ve enjoyed reading these recipes and might just give them a go. The plaid has to be the characteristic dress of the Highlander in the 18th Century but making it look good requires a bit of skill. Trust me I have tried it and there’s definitely an art to it that I do not have. Before we begin though it’s important to say what a plaid actually is. The term plaid comes from the Gaelic ‘plaide’ which means blanket (pronounced ‘platchuh’) and in its simplest terms it is a piece of tartan roughly 5 metres (18 feet) long and about 5 foot wide. This was then pleated and styled into the plaid. The cloth was so large that looms of the day were not wide enough to make it in one go so two pieces of material were actually sewn together along the long edge to make the plaid. To begin the centre of the plaid was pleated. 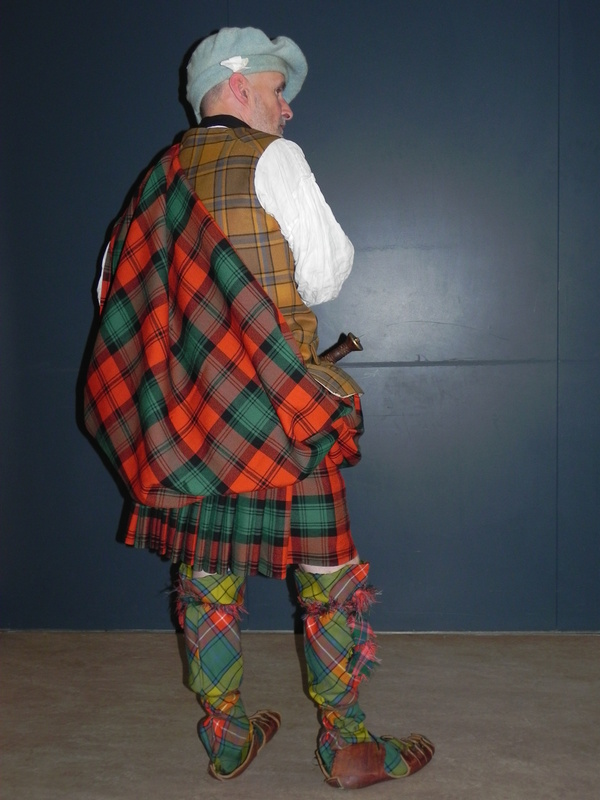 Roughly two thirds of the plaid was folded into pleats reducing the length to about five feet. This was then gathered around the man with the bottom edge falling at the knees. The top half would then be rearranged, typically drawn up to the left shoulder and fastened with a brooch leaving the right arm free. Extra material would be tucked in at the waist to create pockets. The plaid could also be used in poor weather to cover the shoulders and arms from the cold and there are some who believe in cold weather men would actually dip their plaid in water as wetting it would allow the wool to swell offering better protection against the wind and cold. In sub-zero temperatures this could also create a layer of thin ice on the surface of the plaid which would further insulate the owner. 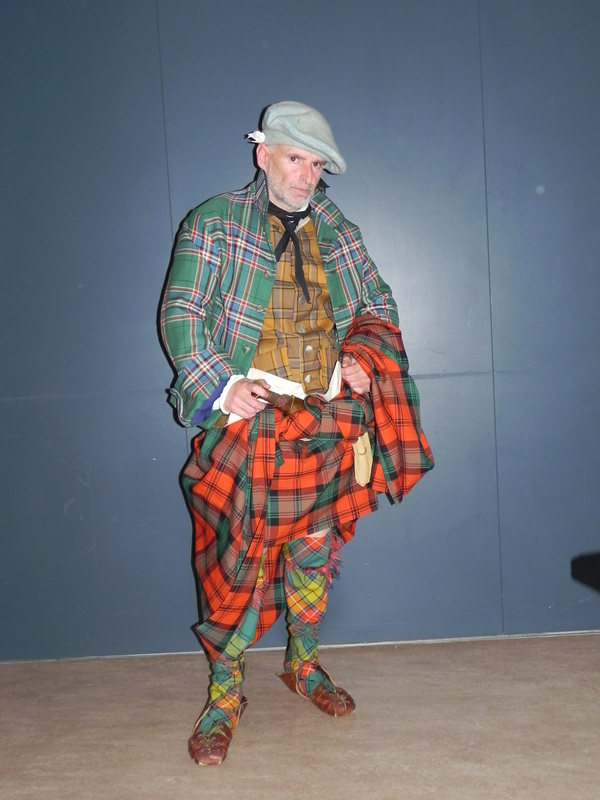 In most places you’ll find it noted that plaids were made up first by lying out and pleating the fabric and then the Highlander would lay down on top of the pleats and wrap the fabric around himself securing at the waist. However, with up to 21 feet of material this was likely to be unmanageable for all but the wealthy as there would be no room inside for such masses of fabric and laying it out in the wind and rain seems rather impractical. Quite possibly many people may have had the plaid already pleated and ready to secure so would simply have to take it off its hook and secure it to them via a belt of rope therby eliminating the need for a large room to prepare. 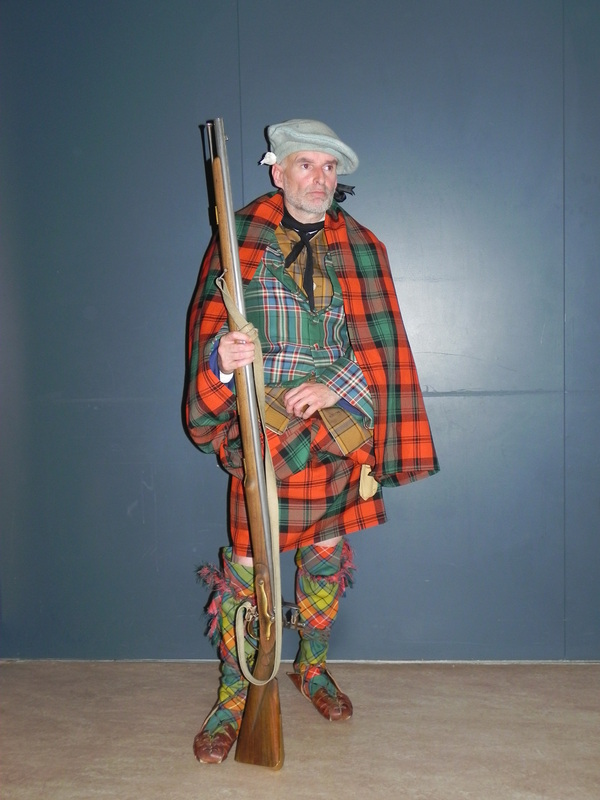 The traditional plaid was banned in 1747 following the Battle of Culloden when it was ruled that anyone wearing the plaid, trews or tartans should be imprisoned for six months for their first offense and transported for seven years if they were caught again. Hopefully you’ve found this interesting and i hope you are all about to go and grab a blanket and give it a shot. One of the most common queries we get at Culloden is people researching their own family history and trying to understand more about the clan from which they come. So, we thought we’d do a little insight into clans to give you a bit of background on the complicated topic. First things first: just what is a clan? The word clan comes from the Gaelic clann meaning children or family. A clan was typically a community of people living in roughly the same area at the head of which was the Chief. Members of this community could be related to the Chief by blood or they could have been inhabitants upon his lands. The members of the community, or clansmen, gave their loyalty to the clan Chief and in return he gave them protection, justice, and leadership. Clan members often took the Chief’s surname whether they were related to him or not. A large clan would have branches or septs, headed by Chieftains who originally would be related to, or appointed by, the Chief. These septs were other family units who did not share the same surname as the Chief but treated him as their own head. Not everyone in rural Scotland was part of a clan. Unlike those in the Highlands, the Lowlands had similar communities in places such as the border regions, but their structure and customs were somewhat different from those of the Highland clans. The Border Clans were distinct in their customs and appearance, country tenants would rent land from local Landlords or Lairds without any of the benefits or responsibilities of Highlanders under a clan Chief. However, this didn’t mean that the tenants were not forced to fight for their landowners. So, the important question, how did you go about becoming a Chief? The Chief owned the lands, managed the estate, commanded the clan in times of conflict, exercised judicial powers over his people and provided them with assistance in times of difficulty. At the same time they continued to uphold the clan traditions of hospitality, kinship and Gaelic cultural patronage. The role was usually inherited by the eldest son, although this didn’t always happen. Typically Chiefs were well-educated, often well-travelled politicians or businessman who operated in wider economic, political and cultural worlds. Between the Chief and the clansmen was the tacksman who was often related to the Chief. They rented out the Chief’s land and gathered the men when the Chief wanted to go to war. This system meant the Chief was not personally involved in these operations and could therefore retain his position as ‘father of his people’ unimpaired. Whilst we might understand what a clan is we still need to discover how they formed in the first place? Clans did not derive from any single race or tribe, indeed they were descended from a variety of tribes that at one time settled in parts of Scotland, races such as the Celts, Picts, Britons and the Norse. The first language of the Highland Clans was Gaelic and at one time this was the majority language of the country, but a divide began to open up over time between the Lowlands and the predominately Gaelic speaking Highlands. This language divide helped to separate the Lowland Scottish families and the Highland clans and with the geographical divide two different cultures began to emerge. The general power of the clans increased the further away they were from the centre of power and authority in Scotland, which varied with where the monarch chose for his or her main residence during any given reign. The clan system no longer exists as it did in the 18th Century, so what happened? By 1745 the clan system was already changing with some Chiefs becoming more interested in money than men and dispensing with the tacksmen as costly intermediaries. The Chiefs had always been at odds with the established authorities in Lowland Scotland, be it through the differences in culture, language, custom or other factors. However, over time and with increased exposure to the rest of Scotland, some of the Chiefs, rather than seeing themselves as being at the head of an extended family, began to take on the role of land owners along the lines of the English or Lowland Scots landlord. Gradually many of the Chiefs desired to live similar lives to their counterparts in the Lowlands and in order to fund the expensive lifestyle that this entailed they set in motion changes to the fabric of the Highland way of life. Thus a painfully slow alienation of the Chiefs from their clans gradually began. Many people believe it was Culloden that caused the demise of the clan system but in reality Culloden acted merely as a catalyst, accelerating the process of social change within the clan system. After the battle the Government pushed ahead with legislation to alter the way of Highland life. The Act of Proscription (1746) was a series of measures designed to limit, if not destroy, the power of the clans in order to remove any future threat from the Highlands to the rest of Great Britain. The Act included banning the wearing of the traditional Highland dress, disarming of the population and other such measures. The law was enforced mercilessly by the Government and it is said that tens of thousands of Highlanders were murdered by Government troops in the space of a few years after the failure of the 1745 rebellion for trivial crimes and indeed many such executions were said to have been completely arbitrary. In 1747 the Heritable Jurisdictions Act removed Chiefs from their hereditary power to impose punishments of imprisonment or death and they became ordinary landlords. Their wealth had been reckoned in men and now, with their lands remote and poor in comparison to the south, they were no longer important. Rents were increased and whole communities were uprooted and evicted to make way for the more profitable sheep, with little and often no concern for their wellbeing. Gradually much of the Highlands, once teeming with thriving communities, the clan system at the heart of them, emptied. A great mass of people had been forced to emigrate to the Lowlands of Scotland or overseas, some had left voluntarily, some were assisted by their former Chiefs but most were forced out by the Chiefs-turned-Landlords. Whilst this was a huge loss to Britain it proved an immeasurable gain to those countries abroad to which they travelled and from which, generations later, their ancestors have returned on a pilgrimage to a proud past. Which brings us full circle to today and the many visitors we get to welcome to Culloden in search of their ancestry.